When a medical mistake results in a tragedy, the media prosecutes the healthcare community in the public forum. Trust in the healthcare system is eroded with the publication of these events. The safety of healthcare is of critical concern for all of us. We expect flawless execution when it comes to our healthcare needs. Techniques have been identified by The Joint Commission (TJC) to assure quality and reduce variation in the services provided. One of these techniques is Healthcare Failure Mode and Effects Analysis (HFMEA). 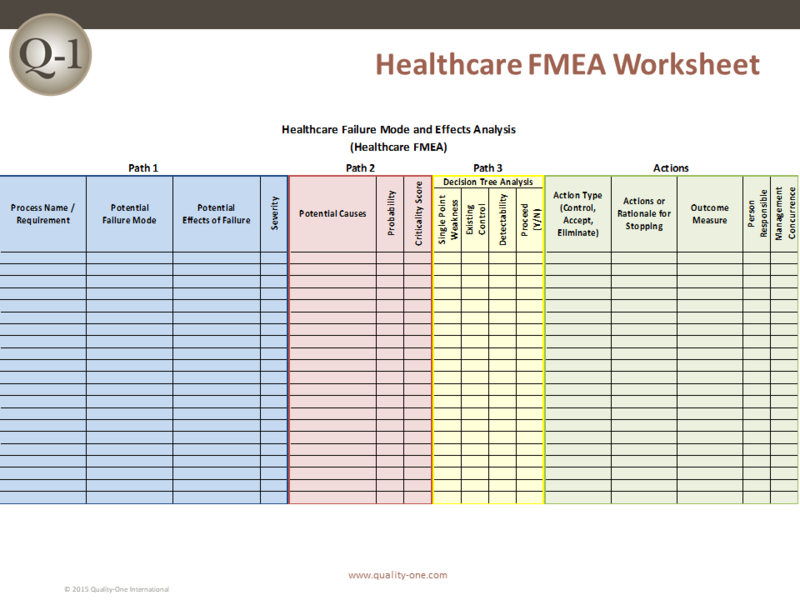 Healthcare Failure Mode and Effects Analysis (HFMEA) is a process used to identify potential failures and their causes before future services are provided. HFMEA can also provide opportunities to improve current services. Patient safety is ultimately the goal of the HFMEA Process. Healthcare FMEA is a prospective assessment that identifies and improves steps in a process and reasonably ensures a safe and clinically desirable outcome. 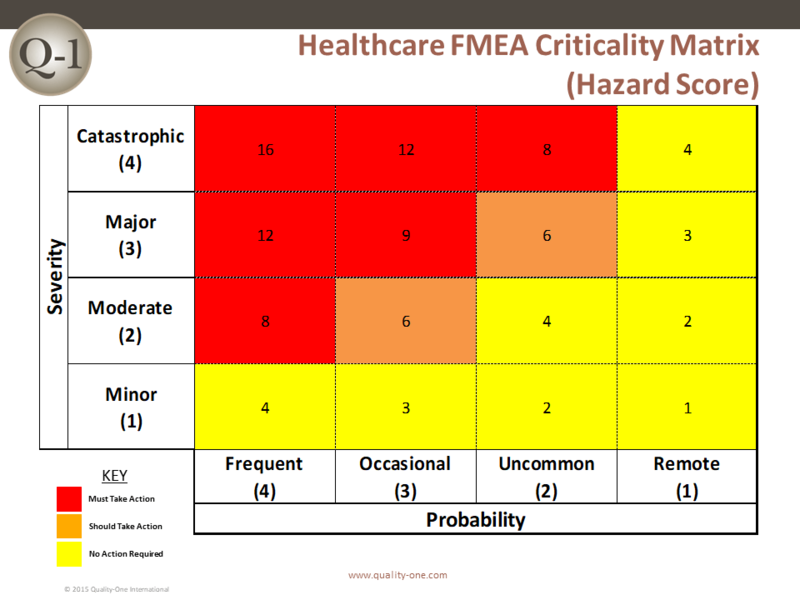 HFMEA is a systematic approach used to identify and mitigate risks which could potentially result in patient tragedy. Accident prevention has not been a major focus of healthcare facilities. Basically, hospitals have used common sense and experience as the primary way to identify problems. A prevailing belief also exists that healthcare providers perform faultlessly. As is true for all hazard analysis approaches, risk is the substitute for failure on new and changed processes. It is good practice to identify risks on a process as early as possible. Early risk identification provides the greatest opportunity for verified mitigation prior to procedure use. The following process reflects the Healthcare FMEA form and the Quality-One approach used in efficiently completing the analysis. This column permits the engineer to describe the process step that is being analyzed. The function is the “Verb-Noun” that describes what the process operation does. There may be multiple functions for any one machine or piece of equipment. The Effects of a Failure Mode on multiple customers are listed in this column. Many Effects could be possible for any one Failure Mode. All Effects of Failure should appear in the same cell or grouped next to the corresponding Failure Mode. Catastrophic Event (9-10 in traditional FMEA). Examples may include: Patient death or major loss of physiological function, wrong surgery, wrong patient, wrong body part removed, infant abduction or improper discharge, death to visitor / hospital staff (or hospitalization of 3 or more staff), equipment damage of $250,000+ or fire. Major Event (7-8 in traditional FMEA). Examples may include: Patient has permanent loss of bodily function, disfigurement, additional surgery required, increased stay for 3 or more patients, visitors or staff are hospitalized or equipment damage of $100,000. Moderate Event (4-6 in traditional FMEA). Examples may include: Patient has increased length of stay, visitors may have to be evaluated / treated, staff may have lost time or restricted duty or equipment damage of $10,000 – $100,000. Minor Event (Less than 4 in traditional FMEA). Examples may include: No patient injury or increased length of stay, visitors are evaluated but refuse treatment, staff receives first aid or equipment damage of less than $10,000 without any adverse impact on patients. Actions may be identified to potentially change the direction on any Failure Mode with a related Catastrophic Effect. If a Recommended Action is identified, it should be placed in the Recommended Actions Column of the HFMEA. A Scoring Matrix is commonly used to identify the criticality or Hazard Score. The hazard score is entered into the HFMEA form. Generally, the higher the Hazard Score, the greater risk to patient safety. Actions may be directed against potential causes which have a high probability and / or Hazard Score. Special attention must be placed on items with Catastrophic Severity. The Decision Tree is utilized to determine if the failure is single point or multi point. Single point failure is more common as the probability of a single event is much greater than one where two or more individual causes are present simultaneously. The principle of Occam’s Razor is applied in these cases. As described above, single point failures will happen more frequently than multi-point failures. Simple probability dictates actions would be expected against single point failures. If a control currently exists, a reference to that control is expected. Effectiveness of the control is also considered. If a control measure exists, an evaluation of the measure for effectiveness is discussed. At times a detection measure is so obvious, a formal control may not be necessary. If an action would improve detectability then the action is entered into the Actions column on the HFMEA form. A decision to proceed is expected. If the risk is low, the analysis may stop at this point. Rationale must follow the expectations of the hazard analysis. Eliminate: Error proofing and probability reduction are applied by identifying the actions which make it not possible for the error and failure mode to occur. Control: This action type will identify the error and make it known that a control measure is required or an automatic control is applied to catch the error before the event can be experienced. Accept: Inherent risks may be very low or the control for the error is currently acceptable. Any action taken would not be commensurate with the impact on the patient verses the cost to complete. 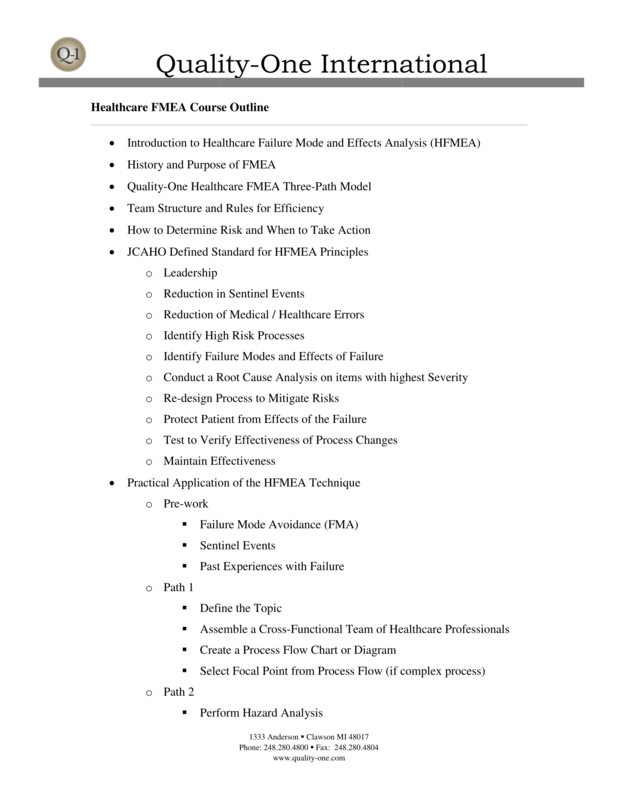 In Section 5 of the Healthcare FMEA, actions are reviewed and next-steps are determined. A measurable outcome must be selected to evaluate effectiveness of the action. Enter the name of the responsible person and the manager who concurs with the action. This allows the team and management to review the HFMEA progress at elimination of errors and / or improved controls at implementation. A review process is recommended until each action has been successfully closed. When an action has proven not to be as effective as desired, a new action may be necessary to mitigate the risk. 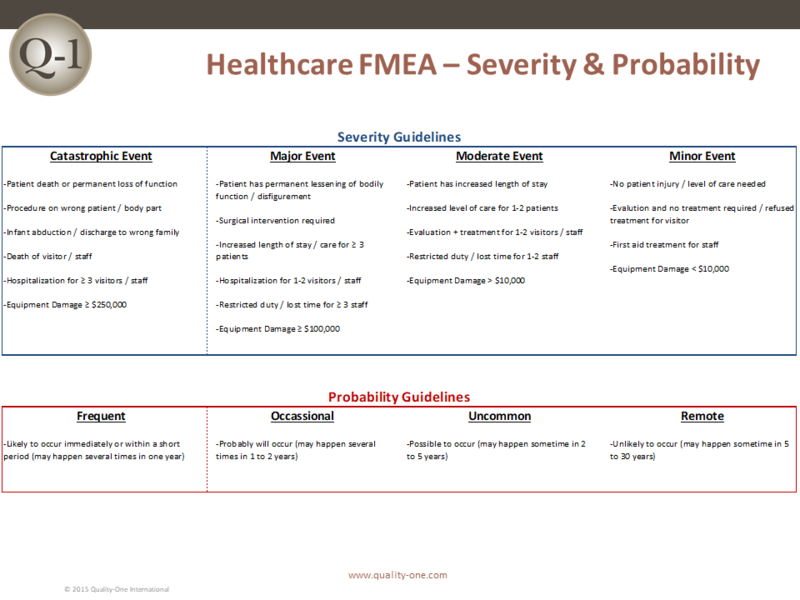 The Healthcare FMEA Services available from Quality-One are HFMEA Consulting, HFMEA Training and HFMEA Support, which may include Facilitation, Auditing or Contract Services. Our team of highly trained Subject Matter Experts (SME) will provide a customized approach for developing your people and processes based on your unique HFMEA needs. Whether you need Consulting to assist with a plan to deploy HFMEA, Training to help understand and drive improvement or hands-on Project Support for building and implementing your HFMEA process, Quality-One can support you! By utilizing our experienced professionals to work with your teams, Quality-One can help you appreciate the benefit of Healthcare FMEA in your organization. Quality-One offers Quality and Reliability Support for Product and Process Development through Consulting, Training and Project Support. Quality-One provides Knowledge, Guidance and Direction in Quality and Reliability activities, tailored to your unique wants, needs and desires. Let us help you Discover the Value of HFMEA Consulting, HFMEA Training or HFMEA Project Support.